Twin Spin is the name, and dual reels are the game. Classic styling meets modern features in one NetEnts most creative online games. Twin Spin is the name, and dual reels are the game. The title speaks for itself as you’re about to find out. With a modern 243 ways to win pay line structure and a wild symbol to boot, this games has made a name for itself in the slot world. Twin Spin is a what you see is what you get type of game. There are no complicated rules. No flashy graphics that hide its true persona. And no bogus bonuses that offer little to the other player. What the game does have is a unique feature that separates itself from the pack. 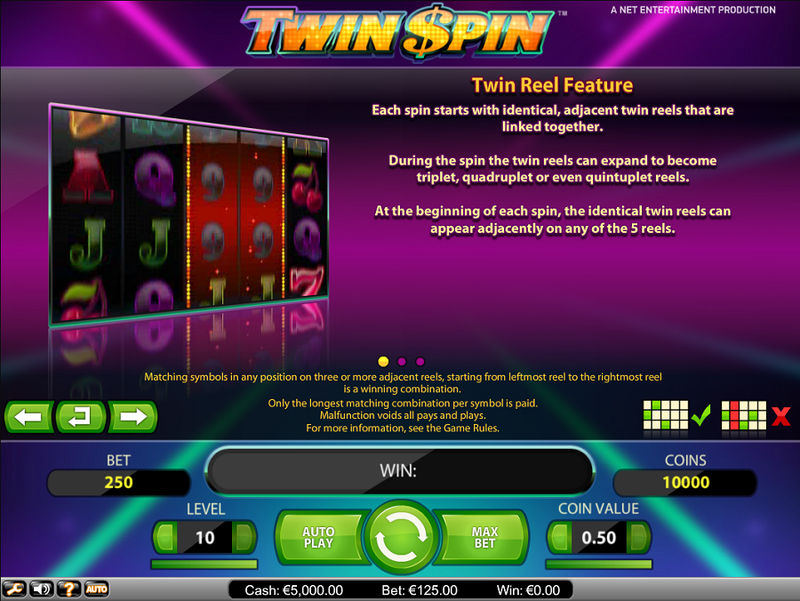 The Twin Reels feature is a fantastic feature you won’t find on other games as the main feature. Twin Reels are the only true feature, but what’s different is that it happens every spin. Identical reels do make this game unique; but, it does have some characteristics that make it appear more like a classic cherry slot from back in the day. A retro gallery of symbols that include cherries, Sevens, Bells and the timeless Bar symbol make the slot play like a one arm bandit found in 1950s Las Vegas. The nostalgia it brings is priceless. It’s the max win of 270,000 coins that adds the real value. Don’t let this classy, retro slot fool you. Its modern design makes its playable on almost any device. For the gamer on the go, you can play this game on your most Apple and Android operating system products. Playing from a desktop is a breeze as well using the instant play, no download version. To learn more about this slot, what better way to learn from someone who has played the slot for real. If you don’t know what Twin Reels are, you’re in for a real treat. During every spin of the reels, a minimum of two adjacent reels will turn the same. 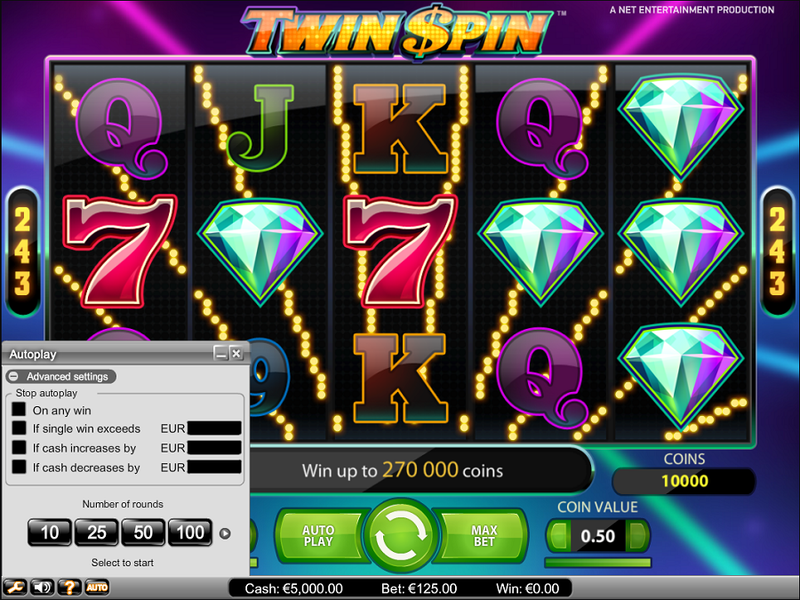 Having two reels with matching symbols, significantly increase your chances of a winning spin. Having five reels with matching symbols pretty much means you’re going to win big. That’s right, up to all five reels can become Twin Reels. Aside from the Twin Reels, no other features are built into Twin Spin. While I do enjoy having a bonus feature a part of every spin – certain elements that many have grown accustomed to such as free spins do make the slot feel a little in the lightweight class. Don’t let the shortage of bonuses fool you. There’s plenty of reason to like Twin Spin. Most notably are the minuscule betting requirements that can pay off in a large way. For just a penny, you can spin the reels and get 243 ways to win up to 270,000 coins. Surprisingly, the maximum coin value is set at just $0.05 You can choose to play between 1 and 10 coins per spin which can make the maximum bet reach $12.50. Still a minor dent in the wallet. 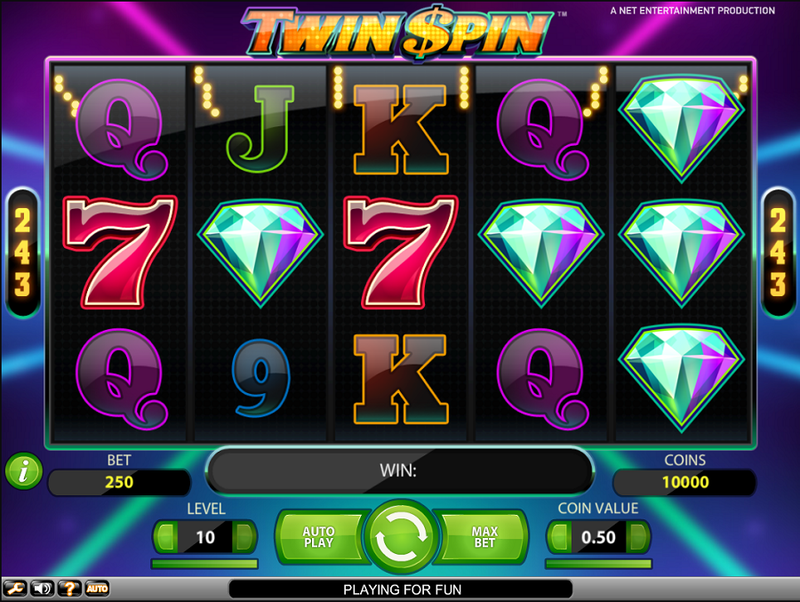 As with all NetEnt slots, playing the slot is easy. All controls neatly laid out on the bottom in my favorite color – green. Maximum bet and auto play options are available to make playing even easier. Dual spinning reels will be the one and only bonus feature. But it’s one of the most entertaining features you will find. Instead of having to trigger a bonus like most slots, this one is never ending. You will also have the benefit of a wild symbol making a winning spin that much easier. If lots of features and bloated bonuses is your thing, walk away and come back until you’re ready to play a slot that delivers on its promise. Spoiled slot players may not give Twin Spin its due respect since it lacks what they have grown accustomed to. Once they give it a spin, the notion of what a slot is supposed to be suddenly changes.